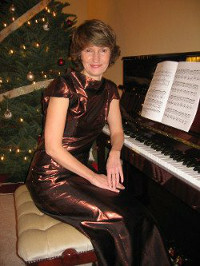 Above Piano Lessons StudioLearning to play the piano with Tanya Otto is energetic, motivating and fun! Contact me for your first lesson FREE! Russian method gives you carefully selected exercises and pieces to build up your technique, touch and tone as a way of expressing yourself. This is a foundation of any style and maximizes the progress, so I strive for you to master both technique and artistry. There no music without both. American approach emphasizes joy of music and exploring different styles. Having students from many countries and cultural backgrounds, I encourage you to bring and learn music from your homeland. I can provide a customized arrangement for your level upon request. I'm happy to work with the Royal Conservatory Program which standardizes 10 level courses of study and measures musical success. Whether you want to become a pianist or play the piano for relaxation, if you start out for the first time or return after many years away from the piano, I will help you to achieve your goals. If you are interested in lessons please contact me for your first lesson free and we can share our love of music.